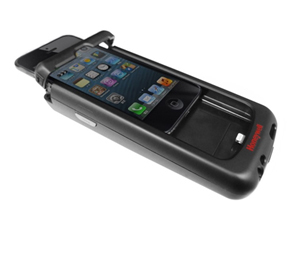 For retailers looking to improve the customer experience, Honeywell's Captuvo SL22 series enterprise sled for the Apple® iPod touch® mobile digital device empowers sales associates by providing them with the tools needed to engage more closely with customers and increase sales floor conversions. The sleek, compact and stylish Captuvo SL22 transforms the popular and familiar Apple® iPod touch® into an enterprise-ready device that provides sales associates with instant access to product information and enables customer checkout, anywhere in the store. From a leader in bar code scanning technology, the Captuvo SL22 features an integrated scanner paired with Adaptus™ Imaging Technology 6.0. Delivering fast and accurate reading of linear, 2D and even poor quality bar codes, the Captuvo SL22 enables various applications, including price and product look-up, markdowns, inventory management and scanning items for purchase at the point-of-decision. Additionally, an encryptionready three-track magnetic stripe reader can be integrated, facilitating quick and easy processing of credit card transactions. Compatibility with the iPod touch® provides retailers with access to over 525,000 apps on the Apple® App Store, allowing sales associates to be armed with all of the information that customers have and more. When equipped with Honeywell's Remote MasterMind™ 3.0 software, retailers can remotely manage deployed iPod touch® devices and other iOS devices, leading to a lower total cost of ownership. In addition to providing added durability, Honeywell's unwavering commitment to quality assurance and control, and its world-class supply chain deliver peace of mind that is unobtainable from smaller manufacturers, inspiring confidence in an investment in the Captuvo SL22. With customers demanding faster and better service and the increasing importance of differentiation for retailers, Honeywell's Captuvo SL22 series is the right solution to help retailers elevate their brand, empower employees, enhance the customer experience, and drive top-line growth and customer loyalty.